At present, the Danish turnkey supplier of concentrating solar systems, Aalborg CSP, has two more large projects under construction. Both installations – one for Danish district heating company Brønderslev Forsyning and one for Australian vegetables producer Sundrop Farms – cover electricity and heat demand at their sites. Yet another first-of-its-kind project was inaugurated in August 2015 in the Danish village of Tårs (see photo), 30 km north of Aalborg. It entailed 4,039 m² of parabolic trough collectors and a preheating flat plate collector field of 5,972 m². Simulations have pointed to a 31 % coverage of annual heat demand even without seasonal storage, since overheating in summer can be avoided by moving the parabolic trough collectors out of focus. Aalborg CSP is an experienced planner of steam and boiler systems and has been offering concentrating solar solutions since 2007. In conjunction with 2 x 10 MW biomass boilers, the 16.6 MWth CSP plant in Brønderslev in northern Denmark, will supply an Organic Rankine Cycle plant with heat transfer oil at around 330 °C to produce electricity at peak price periods. The waste heat from power production will then be fed into the district heating circuit. The CSP plant will have 40 rows of 125-m-long parabolic trough loops with a total aperture area of 26,929 m². The installation of the solar demonstration plant, which is planned to be finished by the end of the year, was supported with Danish Krone (DKK) 20 million from government R&D funding. The total cost of the CSP plant amounts to DKK 83 million. Vegetable factory of Sundrop Farms in the desert of South Australia. The mirror field can be seen on the right of the picture. Its 52,000 m² reflect sunlight toward a receiver on top of the 127-metre-high tower. The two ponds on the left hold desalinated water and also collect rain water. The installation in Australia, however, is an entirely commercial project. 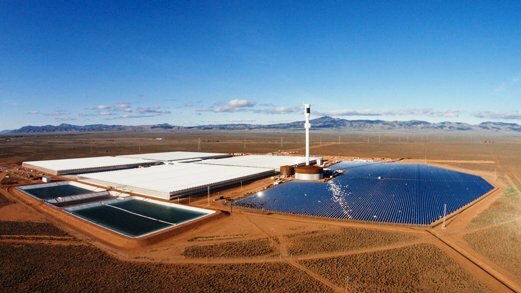 After a successful first pilot phase, which had started in 2010, Sundrop Farms decided to expand the greenhouse area to 200,000 m² and produce over 15,000 tonnes of fresh vegetables – mostly tomatoes – in Port Augusta, in the state of South Australia, each year. The company aims at “growing food profitably in harmony with people and the planet,” as Sundrop´s website puts it. In collaboration with Australian project integrator John Holland, Aalborg CSP has installed a so-called Integrated Energy System based on concentrating solar technology. The system comprises a solar tower measuring 127 metres in height and a solar field of 23,712 computer-controlled mirrors of 2.2 m² each. When in operation, the mirrors are cleaned continually, as the installation is located in the dusty Australian desert. “Every other day, one part of the mirror field is turned to be washed off, and cars move between the heliostats,” explained Anders Egsdal, Project Development Engineer at Aalborg CSP. The central receiver on top of the tower is used for Aalborg CSP´s direct steam technology in a natural circulation cycle, which eliminates the need for forced pumping and reduces energy consumption. The drum generates saturated steam at 223 °C and 25 bar. When entering the turbine, it is superheated and the values drop to 214 °C and 11 bar. Aalborg CSP is planning to finalise the installation in July and bring it into operation during the Australian winter. The Integrated Energy System will be owned and operated by Sundrop Farms. “To remove the high cost barrier of solar concentrating solutions in the manufacturing sector, we’re in the process of devising a service package based on energy service contracts,” Egsdal explained. This means that Aalborg CSP installs, owns, operates and maintains the system, as well as sells solar heat to the client.